Road trips are great brainstorming time for Chris and I. While on our way down to California we came up with a promotional idea for her Christy Evans mystery series that launches in October. The idea was that she's make some of these up and we'd give them away in some sort of contest to tie into the book launch. 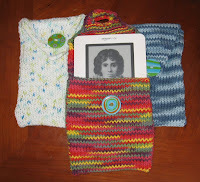 I just got an Amazon Kindle, and she being a very creative and crafty person, I suggested she might reach out to ebook readers by creating knitted bags for Kindles. We spent some time discussing what such a bag might look like, and next thing you know, we were off the freeway to pick up a few supplies, and her first prototype was in the works. 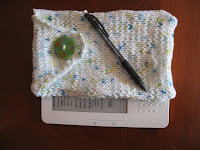 Here are a couple of prototype "Kindle Kozies" she's created. They are prototypes. 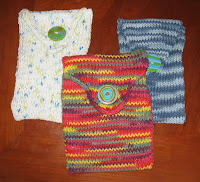 We're still working on the best shapes, closures, fit, etc, but these are already a colorful, fun way to carry your Kindle around. Will the final ones for the contest look the same? Not sure. We're still making prototypes. Which raises a question? What are we doing with these prototypes? Well, heck, let's just give some of them away here! Are you a Kindle ownere? Do you know one? Want a Kozy? Okay, we'll work out the details when we get back from our trip next week. Meanwhile, help us get the word out and check back next Friday for details. We'll be back in Oregon this weekend, and hopefully will figure out how we're going to do it by then. See you guys back here on Friday!